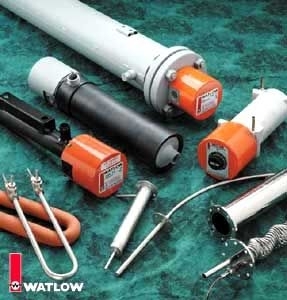 Watlow's immersion heaters are designed primarily for direct immersion in liquids such as water, oils, solvents and process solutions, molten materials as well as air and gases. By generating all the heat within the liquid or process, these heaters are virtually 100 percent energy efficient. These versatile heaters can also be formed and shaped into various geometries for radiant heating and contact surface heating applications. UL® and CSA component recognized elements are available.